Gas prices have again spiked, but as much as the numbers go up, it's unusual to actually see the numbers go up. 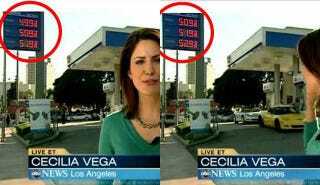 But an ABC News crew in Los Angeles managed to catch a price change in progress during a national TV broadcast — and it's just as two Corvettes roll up to the pump. The rationale behind the sudden jump in pump prices is the subject of intense debate, but the bottom line is clear: Prices at the pump that were high-but-not-that-high a mere week or two ago have now jumped significantly. As I'm writing this post, oil is trading at around $108.75 a barrel, up about $10 in the last three weeks.